WordBoard Keyboard - Save time typing. Hate typing the same thing over and over, one key at a time? 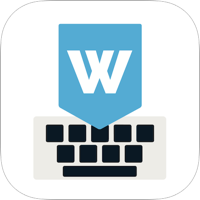 Personalize and pre-program your keyboard with WordBoard. Now you can control what the keys input and save time typing. Insert snippets, templates, phrases and more with a tap of the keyboard. Add a key to automatically type your email address, postal address, hashtag, an email template reply, ASCII art or anything else you can imagine. Keep using the standard keyboard for normal typing and swap quickly to WordBoard to insert saved phrases with one tap. Never have to remember shortcuts again. Save time, type smarter and faster with WordBoard. WordBoard is a universal app, so works equally well on iPhone, iPod Touch and iPad. It's one of the only 5 star rated keyboards on the iOS store. Get up to 6 keys for free or upgrade to Pro to get unlimited keys, the ability to import your recent hashtags on Twitter and Instagram and import emails, phone numbers and addresses from your contacts. To enable the keys you create in the app to be shared with the keyboard 'allow full access' needs to be enabled. We only use this to allow data to be shared between the app and the keyboard, we do not use other features 'full access' allows such as network access. TechCrunch - useful for those who run their businesses from their mobile phones. This is such a practical keyboard for those that constantly use the same verbiage. It’s very similar to text replacement only the formatting remains the same vs. text replacement that bunches it all up into one paragraph. We are a commercial painting company and are using WordBoard to pull in standard wording into generic bid forms. This allows us to have an estimator work entirely in the field from an iPad Pro, and be far more efficient than our previous method involving Tablet PCs. *So convenient!! Amazing app* I’ve been going back and forth using my notes In order to keep up with clients ! So good for my business ! !